Am I looking for Jesus in those around me? What is Jesus calling me to do? Lord, take me where you want me to go. Let me meet whom you want me to meet. Fr. Mychal Judge was the chaplain of the New York Fire Department, who died in the collapse of World Trade Center on September 11, 2001.
but make real friends with the poor. After Jesus multiplied the loaves and fishes, he and his disciples retired to either Magadan or Dalmanutha, depending on which gospel you read. No one knows where the places are or whether they are even specific places or just a description of a place (e.g. a wooded place). Reading the gospels reminds me that I have a call. But upon reflection, I often have the feeling of being lost–like being between two unknown places, Magadan and Dalmanutha. Where am I? Where am I going? What is my call? Jesus, help me to trust you through the hard times that may come. Let me be led by the light of your love. Let your holy saints be my inspiration to follow you without concern for what happens to me. In his homily for the first Sunday of Advent, Fr. Joe Pelligrino uses his experience of comforting those in hospitals to make a profound analogy between the atmosphere in a critical care waiting room and the time of Advent. In the critical care waiting room. . .
Family members and friends can’t do enough for each other. No one is proud. No one stands on ceremony or protocol. Petty disputes and hurts are nowhere to be found. Perhaps there are several patients whose family and friends are waiting in that room. These complete strangers feel bound in their shared hope for their loved ones. Class and race melt away. Each person in that room is a parent or spouse or child or close friend of the suffering one first. He or she is a white, black or Asian, a blue collar or white collar worker second. Everyone in the waiting room pulls for each other. If one family receives good news, there is hope and joy for all. If another family hears sad news, everyone in the room feels their grief. In the critical care waiting room, the world changes. Vanity and pretense vanish. The entire universe is focused on the doctor’s next report. All eyes continually glance at the door. The critical care waiting room is a place of hoping. It is a place of anticipating, a place of expecting. It is a place of Advent. A time for us to renew our concern for the most fundamental values of our lives. A time for us to face the fact of mortality–of those we love and our own. A time to reflect on how our lives are bound up with those we love and how we are called to be attentive to their needs. A time even to become aware of how we are called to be attentive to the needs of all we meet–just as those in the waiting room realize they are not alone in their concerns. Dear Lord Jesus, help me to use this time of waiting for your birth to become more like you. You have come before me and you will come again. But for now enable me to sense your daily presence in my life and to be your presence for those around me. Help me to make Advent a time to change my life forever. Pope Francis reminds us that what we do speaks louder than what we say: “We need to remember that all religious teaching ultimately has to be reflected in the teacher’s way of life, which awakens the assent of the heart by its nearness, love and witness.” There are many who need someone to see themselves as loved. We can fill their need just as you fill our need. Dear Lord, please help me to be more aware of the needs and feelings of others than of my own. Help me respond to them as you would have me do. If we act with love to support those who need support, we show them Jesus’ love and make them conscious of the meaningfulness of their lives and God’s love for them. Dear Jesus, help me be aware of those who need a kind word and a listening ear. Help me to listen to them because you listen to me and I have listened to you. Often I am so wrapped up in my concerns and plans that I forget that I am just one of the members of the Body of Christ. Although I sometimes remember to care for others, I do not keep constant attention to Jesus’ calling. There are many poor people in the United States. Many of them are single mothers or single fathers. They wonder how they can care for their children with such limited incomes. When they experience members of the community reaching out to them, making sure their children are treated the same as all the other children, helping them when they need emergency baby sitting, etc, these people don’t just have immediate problems solved, they experience Jesus Christ present in their neighbors, friends and sometimes, in total strangers. Then they realize that there are no strangers in the Body of Christ. We are Catholic when we are so united to Jesus Christ that His death and His life radiate through every action of our lives. You see, we are not Catholic for ourselves. We are Catholic for others. Dear Jesus, help me to remember that everyone I meet is dear to you and that I can bring them closer to you (or take them farther from you) with how I treat them. Help me to move beyond my personal concerns and enable me to be open to the concerns of all those I meet. He told her that He knew she had been immoral and was continuing her sinful ways. This caused the woman to change her life. Why? It doesn’t make sense that a Samaritan woman would be so impressed with the accusations of a Jewish man. There must be more to this. Jesus’ tone must have conveyed His concern for her. She must have felt that she was being addressed as a person, not as an object of scorn by Jews or even by men in general. Jesus’ tone must have said to her, “My dear woman, you can be better than this.” He speaks to her heart and her heart turns to Him. You can be better than this. Recently that phrase has been bouncing inside my head, not just as something I say to others, but as something I say to myself. I can be better than this. He makes us want to be better than we are. His overpowering love gives us the courage to change our lives and to embrace His Life. The blood that poured from his wounds on the cross has ignited our bodies with the fire of his Love. “You can be better than this,” He says to us in the tender, warm voice of Love. And we will be better. Dear Jesus, I know that I frequently fail to do the best I can. I ask for your help to continually try to do better, to become more like you, to love without any expectation of return, to help those who cannot help me, to be your light to a dark world. As I Do to the Least . . .
Just as you did it to one of the least of these who are members of my family, you did it to me. I ask God, “Of the people I encountered today, who was the most outcast? The weakest and most fragile? The most difficult for me to be around? In my imagination, I replay the moment when I encountered that person. I speak to God about my observations. I tell God my thoughts, words, and actions toward that person. I ask God for forgiveness for any thoughts, words, or actions that were unkind or uncharitable. I thank God for the moments when I seemed to have the right disposition. Dear Jesus, help me to be aware of how I affect those around me. Help me to be sensitive to those who have no one caring for them, to those who seem to be uncaring, to those whom you care for as much as you care for me. Forgive me for the times that I do not notice those who need a kind word or caring attention. Pope Francis reminded economic and political leaders of the world that we all are responsible for the suffering of the poor and that we must act to relieve that suffering. We must never allow the culture of prosperity to deaden us, to make us incapable of feeling compassion at the outcry of the poor, weeping for other people’s pain, and sensing the need to help them, as though all this were someone else’s responsibility and not our own. Weeping for other people’s pain does not only mean sharing in their sufferings, but also and above all realizing that our own actions are a cause of injustice and inequality. Once we realize this, we become more fully human, since responsibility for our brothers and sisters is an essential part of our common humanity. Dear God, help me to cure my indifference about the conditions of the poor. Help me to keep those in need in my mind, my heart, my prayers. Help me to work for the welfare and respect of those who are in need in my community, in my country, and in the world. Jesus, Do I follow you out of love? In another homily Fr. Bloom admits that he sometimes acts out of obligation rather than out of love. Often we have to admit that we too feel an obligation to act in accord with Jesus’ commands and sigh with relief when that difficult task is over. I have to admit there are times that I give a sigh of relief that I have completed another “task” and now can finally return to my own personal concerns. That is when I need to remind myself to stop for a moment and ask what my real motive is. But there is a difference between the kind of relief we feel after a difficult job that seems to have no result and the relief we feel when, for example, we finally get the rambunctious kids to bed and can relax and look at them sleeping and realize that, for one more day, we have taken good care of them just out of love. Dear Jesus, give me the presence of mind to remember your love for me and to love those whom I see, those whom I talk with, those whom I touch in any way throughout the day. 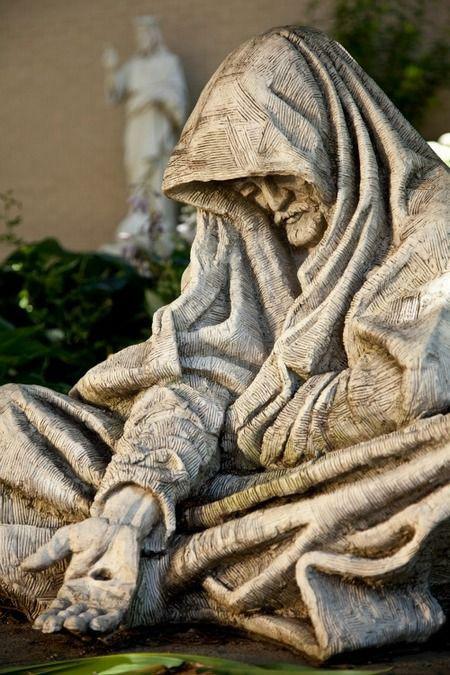 Father James Martin, SJ, reminds us that our lives are not the only ones that have difficulties, that even those who have been closest to God, who have be acknowledged as saints, have had a difficult time living out their faith. The unrelieved spiritual aridity of Blessed Teresa of Calcutta makes her earthly accomplishments all the more remarkable. Her letters also offer some lessons to believers. First, they are a reminder that what could be termed radical Christianity is not simply the province of those called saints. Many imagine that since the saints enjoy privileged access to God in prayer, their work is somehow easier, lighter–a mistaken view that excuses the average believer from striving for sanctity. Instead, Mother Teresa’s life reminds us that holiness is a goal for all believers, even those given to doubt. Second, her letters remind us that dryness, darkness and doubt are natural parts of the spiritual life, whether ordinary believer or extraordinary saint. Finally, they remind us that fidelity does not depend solely on feelings or emotions. Dear God, please take my faith as weak as it is and strengthen it so that I can trust you to take my life where you want it to go and not worry about what you will bring me tomorrow. Only when I trust in you can I live my life for other and not to constantly worry about my own problems.